Dress up your aprons, tea towels, quilts and clothing with original embroidery designs by Heather Bailey. Make beautiful things everywhere you go with this highly-portable pastime. Artwork shown below. 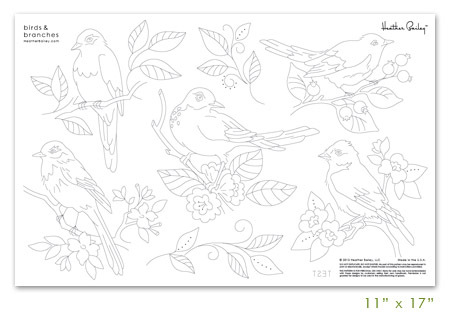 • 11" x 17" pattern sheet with heat-transferable ink. Each design can be heat transferred multiple times. • Illustrated guide to basic hand-embroidery stitches. Iron, ironing board, embroidery floss, embroidery needles, scissors. DMC 349, 420, 581, 642, 830, 930, 3787, 4025, 4066, 4124, 4126 and 4200. No part of this pattern may be reproduced in print or electronically unless otherwise stated. This pattern is for personal use only. All rights reserved. Do not digitize.